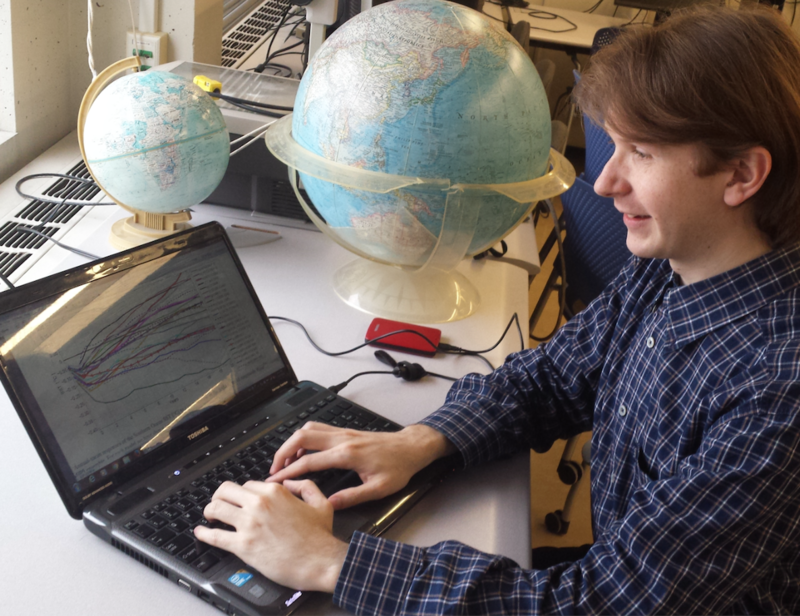 Recent doctoral graduate Yavor Kostov and others from the Marshall Group have been analyzing the persistent cooling trend and sea-ice expansion observed around Antarctica. Around the world, scientists are observing evidence of climate change—record high temperatures, rising sea levels and melting ice sheets. But in contrast to these changes due to global warming, new research recent EAPS doctoral graduate Yavor Kostov and co-authors indicates that Antarctica and the Southern Ocean may be experiencing a period of cooling before warming takes over. And the culprit might be the ozone hole rather than greenhouse gases. Kostov, along with advisor Prof. John Marshall and colleagues, used results from general circulation models (GCMs) and observations to better understand how the ocean, atmosphere and ice interact together, which could lead sea surface temperatures to fall and sea-ice to expand round Antarctica. Kostov et al. argue that sea surface temperatures and sea-ice around Antarctica initially cool and expand, respectively, in response to ozone-related changes in surface wind trends. This is because the strengthening of the westerly winds drives cold water equator-ward away from the Antarctica, encouraging sea-ice growth. However, on longer timescales, warm water is drawn up from below resulting in warming of sea surface temperatures and sea-ice decline. However, not all models transition from a period of surface water cooling and sea-ice expansion to warming and sea-ice loss. What, then, is the mechanism that sets the crossover timescale from cooling to warming? Kostov says “Our paper suggests that the first process—the northward transport of colder water—dominates this fast cooling response, but then over longer time scales, we have this build-up of heat below the surface that impacts the slow timescale of response—the gradual warming. As the winds force cold freshwater away from the Antarctic pole, warm saltwater underneath rises to replace it. This is a slower mechanism because this temperature inversion—cold overlying warm water—is below this well-mixed surface there of the ocean, which changes its depth seasonally. Each winter this mixed layer reaches deeper and takes up some of the heat which builds up because of anomalous upwelling. Eddies deep within the ocean may also interfere with the upwelling of warm water, contributing to the slow warming response seen in some of the models." A 'spaghetti diagram' of the SST averaged between 55S (roughly corresponding to the tip of South America) and 70S latitudes - Image courtesy: the Researchers. "The takeaway is that we’ve identified a fundamental mechanism that allows the Southern Ocean to respond to the change in westerly winds, with initial cooling, but then we show that this might be followed by gradual warming. And we relate this fundamental response to its climatological temperature gradients. So one message is: it’s important that models have the right Southern Ocean climatology to be able to get this response to this shift in the winds." In a world that is increasingly feeling the effects of global warming, Kostov remarks that this new research can help improve climate science and inform policy. Understanding the climate mechanisms at play in the Southern Ocean can not only explain observances of cooling there, but also why the Southern Ocean is able to absorb heat from the atmosphere and how it transports this heat northward where it can be stored deeper in the ocean. This is particularly important since over 90% of the world’s heat from human influences is stored in the World Ocean with a major contribution from the Southern Ocean, and this in turn affects the pace of global warming. Additionally, cooling around Antarctica is often contrasted against global warming, but studies like this help to explain that Southern Ocean cooling is one part of a larger evolving picture in the Earth’s climatological record. Kostov says that their study provides yet another scientific stepping-stone towards understanding the fundamentals surrounding Antarctic climate and ocean behaviors. This project was supported by the NASA Map program and the NSF-FESD program. Story Image: Observed sea surface temperature (SST) trends for 1982-2012 in °C/decade. The blue areas around Antarctica correspond to cooling and the red/yellow areas further equatorward, correspond to warming. 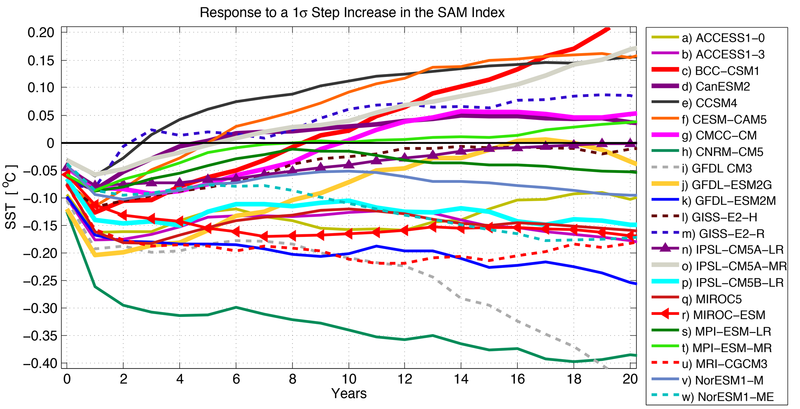 The index plotted from model simulations in the 'spaghetti diagram' above is the SST averaged between 55S (roughly corresponding to the tip of South America) and 70S latitudes - Image courtesy: The researchers. Yavor Kostov PhD XII '16 is now a postdoctoral researcher working at the University of Oxford in the UK.